Welcome to the April 2019 issue of the Global Washington newsletter. Water is an essential element for survival, yet efforts to ensure that everyone has access to this precious resource have faced an uphill battle. According to UNICEF, 30 to 50 percent of water, sanitation, and hygiene (WASH) project fail after two to five years. In the business community, “failing forward” is often considered a sign of progress – companies make mistakes, they learn from them, and they find ways to improve. In global development, however, we often avoid acknowledging mistakes, in part due to fear of alienating donors. In order to accomplish the seemingly impossible – such as ensuring clean water for everyone on the planet – we must be willing to innovate and try new approaches. In the process, despite our best efforts there is always the potential for failure. This month we’re focused on learning from failure when it comes to clean water projects. Yet the same could be said of any other global development sector – healthcare, education, agriculture, human rights, etc. The more open and transparent we can be about what’s working and not working, the faster we can course-correct and have the greatest impact. We call our members “Goalmakers” for a reason. With the UN Sustainable Development Goals in our sights, we have dedicated the next decade to helping our members accelerate progress toward a better and more sustainable future for everyone. 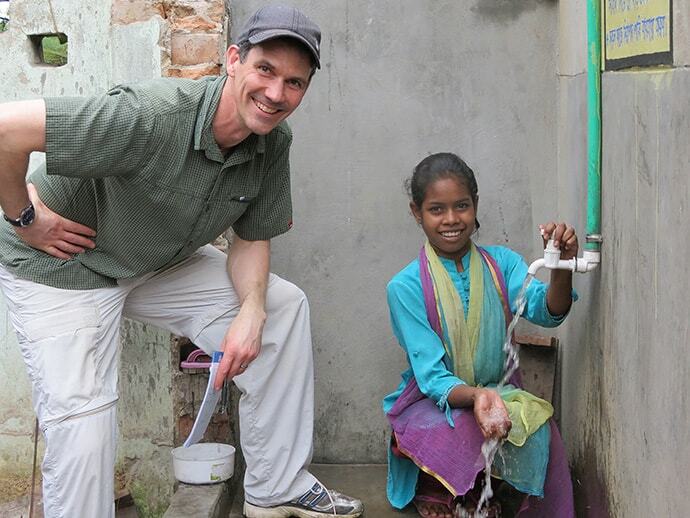 In this month’s newsletter you will read about an inspiring Goalmaker, Water1st’s Director of International Programs, Kirk Anderson, who has devoted his career to ensuring people have reliable access to clean water year-round. You’ll also read about WaterAid’s comprehensive approach to helping communities advocate for and implement self-sustaining water infrastructure. I also hope you’ll join us on April 25th for Failing Fast Forward, an in-depth conversation on this topic with our members: MSR Global Health, Splash, Water1st, and WaterAid. For decades, we’ve heard that access to clean water changes everything. Not only does it improve the health of entire communities, it also gives women freedom to earn an income and children time to go to school, when they don’t have to spend hours walking miles every day just to gather water. That’s why global progress has been rightly celebrated: Between 2000 and 2015, 1.6 billion people gained access to clean water for the first time. But according to the UN Children’s Fund (UNICEF), as much as 30 to 50 percent of water, sanitation and hygiene (WASH) projects fail after just two to five years, leaving recipients of the new wells, toilets or other projects back where they started – even worse off sometimes. This has led to calls for the WASH sector to be more upfront about failures and understanding what went wrong. Without learning from mistakes, we will miss the mark on Sustainable Development Goal 6: to ensure the availability and sustainable management of water and sanitation for all. There are many reasons why water projects fail. But Kirk Anderson, director of international programs at Water1st, says the failure rate is not unique to the WASH sector. In fact, he says that most development efforts suffer problems with sustainability, simply because of the nature of aid. In a market system, when buyers do not purchase faulty, poor or unwanted products, manufacturers quickly get the message that they need to either improve their product or go out of business. But in a donor system, the users are not the buyers. Therefore, unless the buyers (development organizations, in this case) are regularly asking the users for feedback – and the users are willing to give honest feedback about the gift they received – buyers often continue to fund and implement faulty, poor or unwanted programs. Pit latrines are a great example of this. For countries like India that are making a strong push to eliminate defecation in open spaces, installing a pit latrine is a cheap and easy way to mark off another community as having access to sanitation. But pit latrines can smell so bad that many sit unused after just a few months. And once a pit latrine is full, who’s going to empty it? Similarly, some clean water projects are simply insufficient. Water1st’s Founder and Executive Director Marla Smith-Nilson once wrote about how she visited the site of a sealed spring-water catchment chamber in Ethiopia that was supposed to be an “improved water source.” Yes, the catchment was a good way to protect the clean spring water, but the spring itself didn’t provide enough water throughout the year for the community. In additional, the water point wasn’t conveniently located for everyone in the community, which meant that some people still had to walk hours to get there. Then, they had to wait in line for several more hours, because the water trickled so slowly. On the other hand, rain catchment systems – like the ones Hands for Peacemaking Foundation is installing in Guatemala – collect enough water during the rainy seasons to last households and communities throughout the dry seasons, without them having to walk hours to access it. To make collected water safe for drinking, some organizations like Friendly Water for the World are teaching groups of people how to make Biosand Water Filters and set up businesses to sell them. The filters are essentially large buckets filled with layers of “specially selected and washed sand and gravel” that remove pathogens and suspended solids. Microorganisms in the sand can remove up to 99 percent of the pathogens. Up to 95 percent of dirt and metals and 100 percent of worms are also removed during the slow filtration process, according to Friendly Water for the World. The technology comes from the Centre for Affordable Water and Sanitation Technology (CAWST), a Canadian non-profit and licensed engineering firm. According to Friendly Water for the World, the greatest challenge is not the technology itself, but the social dimension – introducing the approach to communities and encouraging them to use it consistently. The high failure rate of water projects is also often attributed to a lack of monitoring. The World Bank has estimated that less than 5 percent of water projects are visited after they’re constructed, and less than 1 percent are monitored long-term. This means that most organizations are unaware – or willfully ignorant – when a project breaks or sits unused. Many water systems are feats of engineering that need to be properly maintained, yet in many cases, no one has been trained on how to maintain the system, or spare parts are not readily available to fix it. That’s why WaterAid, Water1st and others have centered their strategies on local sustainability. With strong input from local partners, these organizations first tackle the technical sustainability of their projects: Is the system easy to use and maintain? Can the technology be used anywhere in the world? Are the spare parts affordable and available locally? Then, they also set up the local communities to keep the projects running. WaterAid works closely with local governments, as befits its belief that ultimately, it is the responsibility of governments to ensure that all of their citizens have access to water and sanitation services. Beneficiaries also contribute financially or in other ways at the start of projects to instill a sense of ownership. In the case of Water1st, not only does the organization train communities on the technical aspects of independently maintaining the new water systems, but it also helps communities institutionalize payment of water fees. According to Water1st, when a project is owned and operated by the beneficiaries, they are motivated to keep it running. Water1st also routinely follows up on its projects to make sure they’re not only functioning but that other sociological issues – like hierarchies or conflicts within the community – are not derailing their success. For years now, the business sector and self-help books have preached the concept of “failing forward” – that failure is inevitable, and ignoring it will precipitate bigger problems down the road, while learning from failure will propel us toward success and innovation. Unfortunately, the WASH sector – and international development as a whole – has been slow to embrace this mindset, mostly because of the risk that donors will pull funding if they admit failure. But some organizations are starting to realize there is no alternative route to success. BRAC and Canada’s Engineers Without Borders are hoping to push the entire industry forward by publishing their mistakes in annual “failure reports.” At one point, Water1st, along with a host of other organizations, also developed a “Water for Life rating” that independently rated WASH programs on their long-term sustainability. 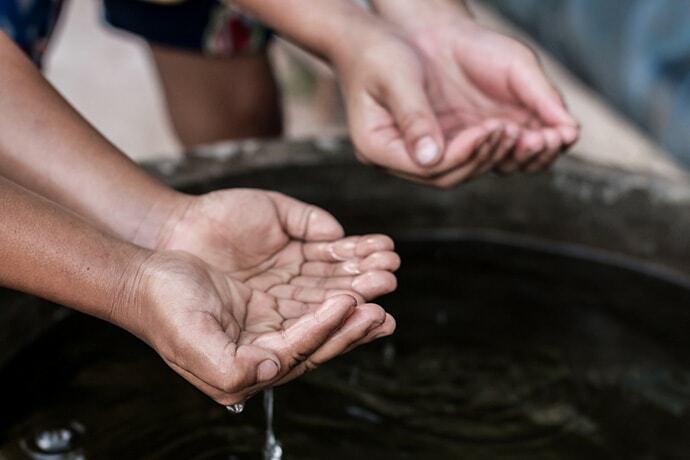 Although the rating system didn’t take off – likely because organizations perceived it as a risk – Water1st believes it still has potential to propel WASH programs forward if donors were willing to support organizations that go through the process. Those that received a high score could be awarded a grant to keep doing what they’re doing, while those that scored poorly would be given financial support to fix the problems. Worldwide, 844 million people do not have access to clean water, UNICEF estimates. WaterAid, a global nonprofit is working to change this. Established in 1981 by members of the U.K. water industry, WaterAid works to close the gap globally on access to clean drinking water, sanitation, and hygiene (referred to as “WASH” for short). The organization is now bringing water resources to communities in 28 countries, on three different continents. “The emphasis was really on water supply in the early days, then coming on to sanitation and how to do that effectively, and now hygiene is a big focus, so it’s an integrated approach,” said Vincent Casey, WaterAid senior manager for water, sanitation and hygiene. Access to clean water, sanitation, and hygiene is crucial not only for daily life but also for health. Every two minutes, diarrhea caused by dirty water or poor toilets kills a child under five years old. Casey says this is why WaterAid also focuses on toilets and hygiene practices in the communities where it works. Clean water alone does not impact the disease burden that exposed human waste can have on a community. WaterAid has staff in 34 countries, including those where advocacy and fundraising work happen, like in the U.S. and the U.K.
A large part of the WaterAid model is ensuring that local and national governments recognize the crucial needs of their people for access to clean water. Casey said WaterAid works at all levels of government, from local communities to national policymakers. “We work a lot with districts or local governments, so operation-wise not only the delivery of WASH but how you keep those benefits in place,” Casey said. In other words, helping create national or district-level policies is important, but not sufficient. WaterAid also works with other NGOs and education and health advocacy organizations to ensure that they are including education about handwashing, good hygiene and sanitation practices. Each in-country WaterAid team works to influence policy, and sometimes directly implements water initiatives, as well. Back in the 1990s, WaterAid helped introduce gravity-fed water schemes for large communities with thousands of people to get water. In each case, the organization created a structure to govern the new utilities. 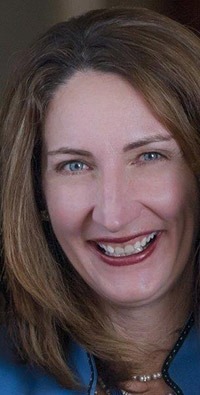 Casey used WaterAid’s work in Ethiopia, which began in the 1990s, as an example. After a management arrangement for a local water utility is recognized by the national government, this type of multi-village model can become a reality. “That’s literally all the villages nominating someone to a board, and that board appointing an executive board to run the scheme, and then that executive board contracts mechanics and people who do financial management and revenue collection,” Casey said. WaterAid evaluated these types of management models in Ethiopia over several decades, and the most recent evaluation from 2018 shows that they are still performing really well, Casey said. Such large-scale gravity-fed water schemes usually supply water from higher ground springs to lower ground areas. There are no pumps or complex equipment to maintain, making it an easier model to establish. Not all of the countries where WaterAid works can support these types of models, especially in rural areas where water is difficult to access underground, or may be contaminated with arsenic or high salinity. In these places, financial stability and investment are necessary. This is where political advocacy comes in. Part of WaterAid’s work is connecting water utilities and private companies with community water associations established in the countries where they work. These relationships are not just for financial support, but also to share best practices for sustainability of services. “A good utility has to be able to have good cost recovery, a good billing system, and good revenue collection processes,” Casey said. Those partnerships also support new water associations with challenges like reducing water lost due to infrastructure and figuring out how to improve efficiency. While WaterAid helps find financing and investment for local utilities in the countries where it works, the organization also encourages governments to invest even more. Casey said leveraging government investment has worked in some countries, including Ethiopia. At its best, WaterAid’s model enables the nonprofit to leave a country entirely. Casey said this is how the process is supposed to work if the job is done correctly. The key, he said, is establishing water utilities as professionalized services. Ultimately and ideally, WaterAid wants to create a sustainable model for delivering water to communities with reliable funding sources before it leaves. Casey said the current challenge is in places where communities do have access to WASH, but suffer from very poor levels of service. WaterAid has US offices in New York and Washington, D.C., with remote-based staff throughout the country, including in Seattle. Chittagong, Bangladesh (2016) – Kirk Anderson poses with Israh Jahan, a young girl whose family lives in a low-income area in the city without access to clean water. Water1st worked with a local partner organization to help her family and neighbors construct this water system. Photo provided by Kirk Anderson. As a young Peace Corps volunteer in Lesotho, Southern Africa, Kirk Anderson was hitchhiking to the capital when a United Nations truck stopped to give him a lift. He climbed in and found himself chatting with the undersecretary of health for Sub-Saharan Africa. “What’s the most important health problem to address in this area?” he asked her. She quickly replied, “It’s nice to have an easy question once in a while.” If every community had water, she told Anderson, 80 percent of her job would be done for her. Her response matched Anderson’s experience as a middle school teacher in the country. When his community ran out of water in the dry season, kids didn’t come to school because they were waiting at the spring to fill a cup with water so they could make breakfast. 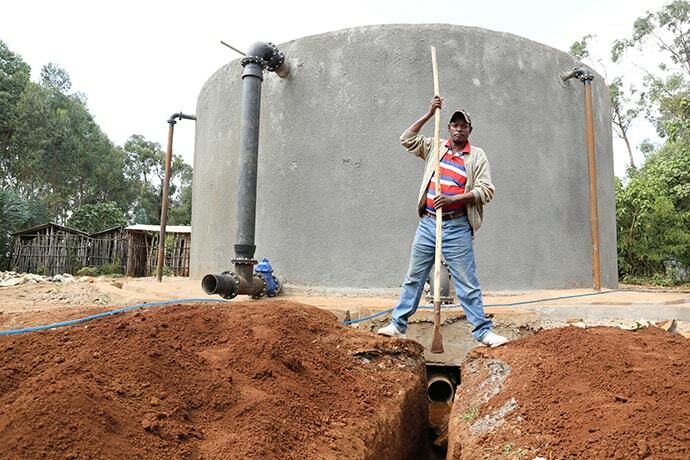 “Lack of access to water is really holding my community back,” Anderson realized. Yet most water projects he’d seen had failed, in large part because governments and funders installed pipes and pumps, and then walked away — leaving neither the human capital nor financial resources to ensure they remained viable. A decade and half later, when Anderson was working on salmon recovery for King County, he still wasn’t sure how development projects could be more effective than those he’d witnessed. Then his wife took him to a talk by Marla Smith-Nilson, who would go on to found Water1st. Smith-Nilson spoke about the importance of working through local partners who understand the subtleties of their cultures and communities. Anderson joined the fledgling Water1st, first as board chair and then as director of international programs. His wife, Jennifer Norling, was also an early supporter and today is Water1st’s director of development and communications. The organization provides ongoing funding and support to partner organizations that build and maintain water infrastructure in countries across Central America, South Asia and Africa. 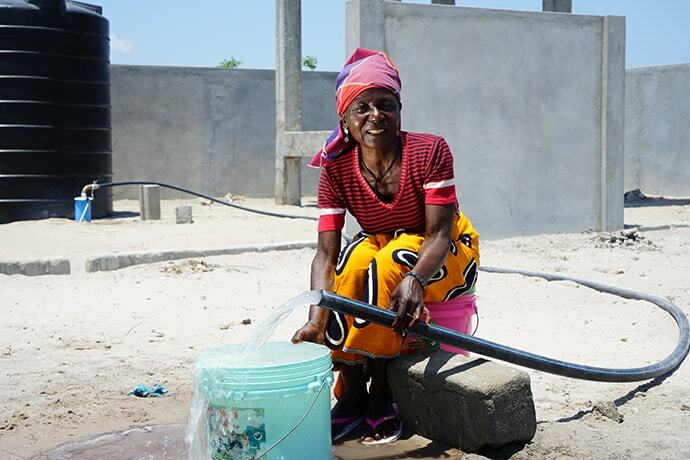 Communities are also motivated to keep the water flowing because they get a high-value service: Instead of a central hand-pump, projects include household water taps. Families pay a monthly fee for the water they use. That ensures there’s money on hand to rapidly make repairs and hire plumbers and other experts when needed. Increasingly, projects are incorporating household meters to allocate the costs of operating the water system fairly and to encourage good management of an incredibly valuable shared resource. Consistent funding from Water1st means organizations can retain staff and continue to build their expertise, Anderson explains. It also allows them to translate lessons learned into improvements. In Honduras, for example, the partner organization agreed to add meters only after five years of working with Water1st; now all new projects in the country have meters. The 14-year-old organization has also learned from its failures. 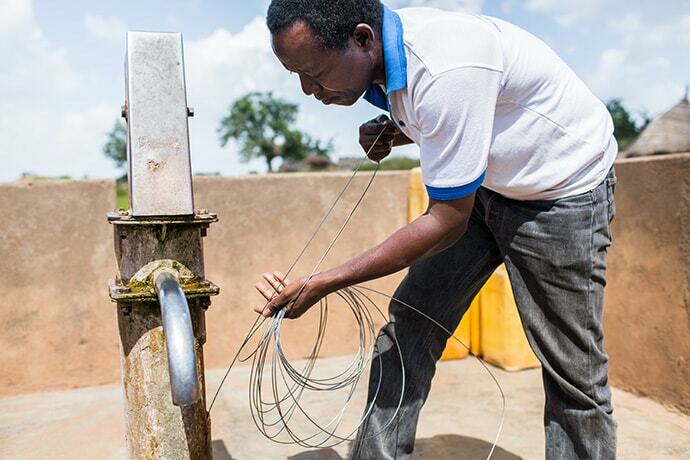 In Ethiopia, Water1st initially funded an organization to put in community water points. But those aren’t selling much water, Anderson said, indicating that people are using it only for cooking and drinking, and not to improve their hygiene. A community tap is what Anderson calls a “marginal improvement.” While it provides a source of clean water, people still must waste time traveling and waiting in line. Moreover, once people have to travel more than about 100 meters, water use — and with it, hygiene — falls dramatically. “I don’t want my mom walking 100 meters and carrying water back to her house every morning, so that she can cook, drink, clean the house,” Anderson says. “That would be a problem for me, so why would I build a problem for someone else? Instead of wasting money on marginal improvements, Anderson argues, invest in real solutions from the start. Water systems that reach all the way into people’s homes are a cost-effective solution, Anderson says. They allow families to install flush toilets instead of latrines that attract disease-spreading flies. They also encourage people to bathe frequently, which is especially important in places where people have frequent contact with livestock, soil and sick children. Lesson learned: In Ethiopia, Water1st is now working with its local partner to install household taps. 11 year old Kidist uses the water station at her school in Addis Ababa. Photo credit: Gavin Gough for Splash. In March, Splash’s Seattle office hosted two of its leaders from Ethiopia: Dawit Alemishet, Country Director, and Kelbessa Wordofa, Director for Project WISE (WASH-in-Schools for Everyone). They were in town to meet with colleagues planning the launch of Project WISE (WASH-in-Schools for Everyone), an initiative to reach every government school in Addis Ababa, Ethiopia, and Kolkata, India, with WASH infrastructure (water storage, filtration systems, drinking and handwashing stations, and improved toilet facilities), as well as behavior change programs for children and adults, and strengthened menstrual health services for girls aged 10 and above. Splash has reached 79 schools serving 78,000 children in Addis Ababa, and 194 schools serving 55,985 children in Kolkata. Through Project WISE, the organization expects to reach approximately 1,600 schools serving one million children by 2023. Splash’s efforts will benefit even more children like Kidist, a fifth-grader who is 11 years old. Kidist is very pleased about the improvements that Splash has made at her school. She especially loves the different colored drinking and handwashing stations and is attracted to wash her hands and drink from them. In the past, she and her brothers used to bring water from home, but it was never enough to last all day. As Kidist explained, they couldn’t bring a very big bottle of water, since her parents don’t have access to water in their home and needed to source water from the neighborhood tap. Sometimes her brothers finished their water before lunch, and she would share her own half-liter bottle with them. Thanks to Splash, Kidist and her brothers and all the other students can access clean water at school all day long.